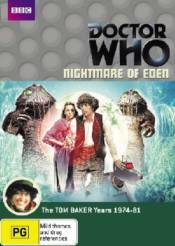 Two spacecraft fuse in a hyperspace collision, and with the dimensional instabilities threatening everyone aboard, its fortunate the Doctor (Tom Baker), Romana (Lalla Ward) and K-9 arrive to help. But when a crewmember is found clawed by a ferocious creature, it seems theres something even more frightening stalking the corridors. But what can this have to do with a zoologist, Professor Tryst, his CET projection machine, and a planet called Eden?